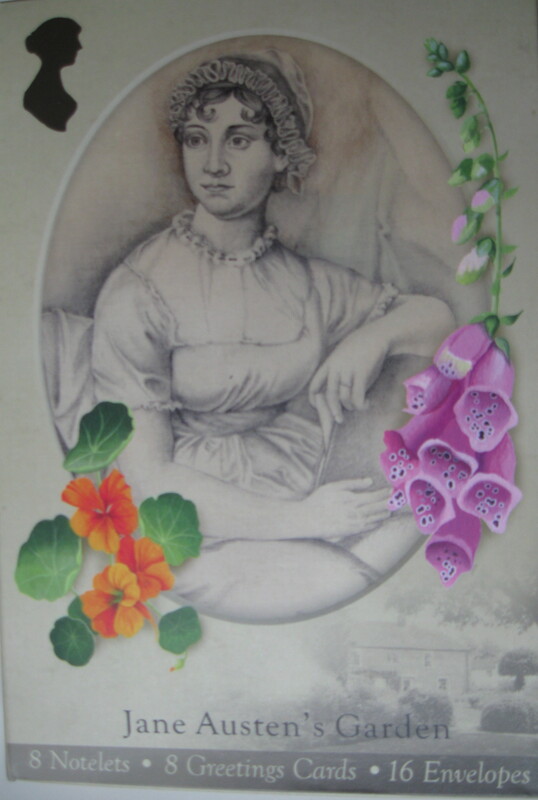 Welcome to the official U.S. Jane Austen Gift Shop where you'll find the Jane Austen Garden Range of gifts, featuring botanical illustrations from Jane Austen's Garden and images of Jane Austen's House Museum. The Jane Austen Garden Range features the following flowers: Strawberries, Sweet Peas, Poppies, Grape Hyacinths, Snowdrops, Leopard's Bane, Foxglove and Nasturtiums. Stationery and greeting cards are printed on high quality paper and are packaged in cellophane. Postcards do not have additional wrapping. 6% sales tax will be added to purchases shipped to a Pennsylvania address. Choose from our exclusive selection of gifts for the Jane Austen fan, direct from Jane Austen's House in Chawton, England. Size: roughly 3" by 7 1/2"
poppy sweet pea leopard's bane snowdrops grape hyacinth strawberry foxglove nasturtiums no preference - surprise me! Jane Austen Luxury Stationery Set: Jane constantly wrote letters to her sister when they were apart. Revive the art of letter-writing with this luxury stationery set. What's really special about this set is that there's a facsimile of Jane Austen's signature running faintly in the background of every page. 16 sheets of quality writing paper with a small botanical illustration in the bottom corner plus sixteen continuation sheets - the continuation sheets do not have botanical illustrations but do have the Jane Austen signature. Includes 16 envelopes. Size: Writing paper is roughly 5 3/4" by 8"